As usual, going to Colours was an opportunity to meet up with Peter F. and catch up with developments at Calpe Towers. I know quite a few of you keep asking about what’ll be next off the production line, so let’s deal with that before I move on to the main topic for today. As you might have noticed from my previous posting, some charging Prussian musketeer packs are the next thing we’ll be adding to the website. Following that, French march-attack infantry are due to go into production moulds and then attention will, I think, turn to French and Saxon artillery. Somewhere in the mix are re-modelled Prussian dragoons. Number of figures: Peter is concerned not to let the project take up too much sculpting time. That’s his prerogative, especially since he’s offered to do the actual sculpting work for free. So this means that the pack will be limited to four figures. Fit with the Calpe range: we discussed a lot of the suggestions that you have been kind enough to make along with my own ideas and it emerged that several of them were things that Peter plans to do as part of the main Calpe range anyway, so we think it’ll be best to avoid those for this project. 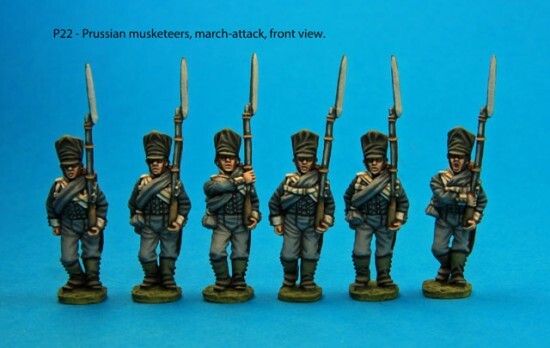 So the bad news is that things like Pommeranian national cavalry, casualty figures and the Saxon jaeger company won’t form part of this project; on the other hand, the good news is that these will turn up in the main Calpe range in due course. Make it special: the flipside of the previous item is that Peter’s keen to make the pack something special or unique or unusual. So that’s where the detailed head-scratching is now focussed. A group of figures hit by a cannister volley. The Perrys have done this a couple of times for cavalry but I’m thinking more of an infantry group here. They might fit together well as a group based within a battalion. The nationality could be French, Saxon or Prussian but it would probably work best if it complemented one of the existing Calpe sets (e.g. the new charging Prussian musketeers). A group of Marie-Louises taking refreshments from a cantiniere. They could be standing around and fairly ill-equipped. Some of the poses from Knotel Band XII Plate 24 could form the basis of this. I especially like the chap with resting his reversed musket between his shoulder and forearm. Little details like the cloth wrapped around the musket’s trigger are nice too. I’ve got this odd hankering to include a wounded figure with his arm in a sling as part of a pack like this. A command group interrogating a prisoner. This gives an opportunity for a multi-national group and for the prisoner to be from an “exotic” unit. A vignette based on a Knotel painting. There are probably quite a few options here but the one that sprang to mind was the painting of the incident involving “Crazy” Platen and the French lancer where the coup de grace was administered by a Lithuanian dragoon trumpeter using his instrument. Maybe you can think of some other candidates in a similar vein? One that I think has already been suggested is Johanna Stegen handing out ammunition to Prussian infantry at Luneburg. An artillery crew of four figures doing something unusual that wouldn’t be covered by of the usual Calpe crew packs – for example, changing a broken wheel or moving a gun by use of a prolonge or the infamous bricole (if I could actually work out what one is!). This could apply equally well to French, Prussians or Saxons. There are also out-of-the-ordinary crew options to man guns already in the Calpe range: Russo-Prussian Legion, weren’t there one or two Landwehr batteries? A group of cavalry troopers on scouting or picket duty. That could call for different poses possibly involving drawn carbines. Maybe even one trooper dismounted looking at tracks while his colleagues hold his horse for him. Again, this is derived from a suggestion made in an earlier comment. A group of foragers/looters rounding up provisions from the unsuspecting local populace. The germ of this idea comes from a seemingly ever-popular set of Bavarian foragers done by Foundry. So that’s a fair amount to sink your teeth into. Start chewing and let me know how it all goes down.